Evil Haman becomes powerful but is furious when Mordecai doesn't bow. He plots to kill every Jew in a single day. The King ordains it. Mordecai asks for Esther's help. She can only speak with Xerxes if he summons her, or she dies. Esther prays and enters for her people. Esther invites Xerxes and Haman to two banquets. Xerxes honors Mordecai and humiliates Haman. Esther exposes Haman's plot to Xerxes, and he executes Haman – victory. Esther and Mordecai reverse Haman's evil plan. 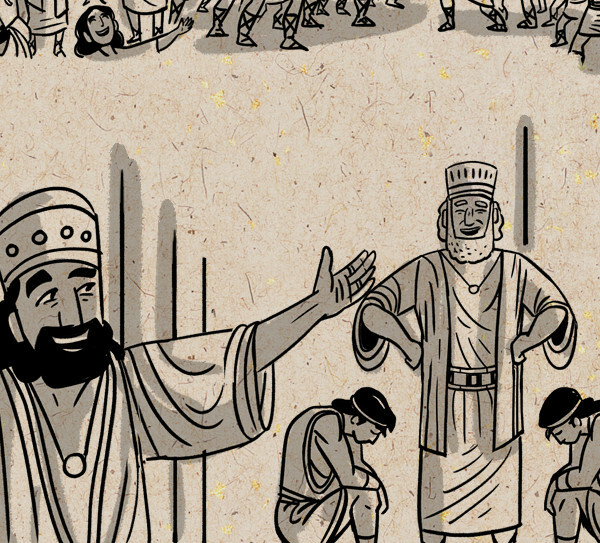 Xerxes' decree is irreversible, but he issues a new one allowing Jews to defend themselves. Purim is established.